shine brite zamorano: candy corn! The artist Margaret Morrison creates photorealistic paintings of many sweet treats. 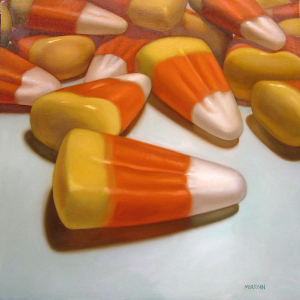 One of the paintings just happened to be a 4' tall candy corn still life. Excuse me while I wipe the drool from my chin. I shared a number of her paintings with my first graders today. We talked about what a still life is and how Margaret's paintings are examples of the still life subject. Students agreed that these paintings looked real and I pointed out her use of light and dark to create shadows and cast shadows. I reminded students that that when they made their Wayne Thiebaud landscapes they pressed hard to soft to create 3d space. Today they had to press hard and soft again in order to make shapes look 3d. We drew out our images together, talking about overlapping of shapes while we worked. When it came to coloring the drawings, we used crayola colorsticks. We pressed hard for all the yellow parts. We mixed our yellow and red for the orange parts. When we didi that I modeled pressing softly with the red , so that it did not overpower the yellow in the mix. We then softly added pencil shadows to one side of each of the treats. When we added the cast shadows we pressed harder to make them darker. The kids did a great job with the project. The perspective of the shapes was a little tricky for some, but many of the drawings looked 3d due to the overlapping and the shading. Thanks for the tip about Morrison. I spent quite a while on her site -- I loved the tomatoes and onions, too!! I'm very impressed by your 1st grader's drawings!! Wow. I am always impressed by how you get the very young to add value to their work. Great work first graders!